Apple's voice-activated assistant is now a well-known personality in his/her own right, but unless you've taken the time to dig into all the features that Siri offers you might not realize just now capable it is (particularly since the arrival of iOS 7). 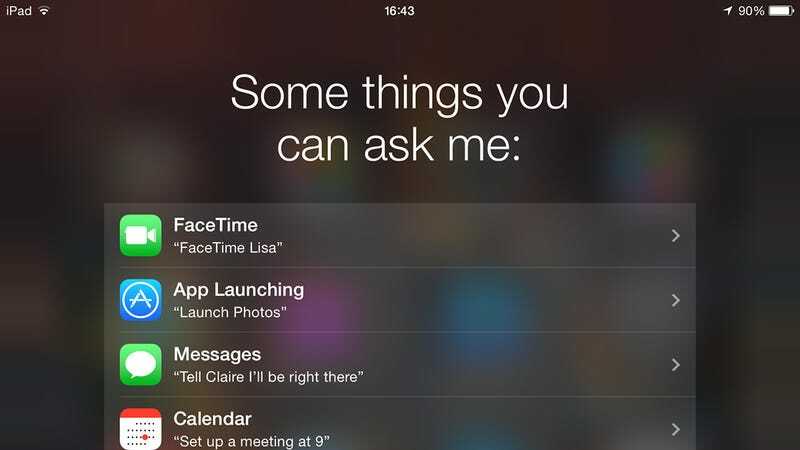 Here are seven ways to get Siri working harder for you. Siri can not only "turn off Bluetooth" but will also help you find a setting if you don't know where it's located. Try asking to "change the font size" or "adjust the screen brightness" or "edit Safari settings," and Siri will direct you to the right options page, with no need for you to search through screens yourself. Call up the app if you want to reconfigure your iOS gadget but aren't sure where the option is (or don't want to go through multiple taps to find it). Siri pulls in data from the Rotten Tomatoes review site, so you can ask it "how good is The Dark Knight Rises?" and get a response based on hundreds of reviews. You might have to pick from a shortlist of potential options if Siri finds several matches, but the process is still pretty painless. You can also ask "how long is The Lego Movie?" just before you sit down in your seat, and get a quick response. If soccer isn't high up on your list of priorities, tune out now, but Siri can tap into all kinds of information about the 2014 World Cup in Brazil in addition to its prowess at covering other sporting events. Ask "when is England v Italy?" or "when does the World Cup end?" to find out when the next match starts or when you can finally escape from the wall-to-wall coverage. Try "who will win the World Cup?" to get the current state of play in the tournament. Twitter and iOS are best buddies these days and you can leverage this in all kinds of useful ways. As well as asking "what's trending on Twitter?" you can also ask what specific people, accounts and handles are saying right now. Of course you'll need to give Siri permission to access the Twitter account on your iOS device if you haven't already done so. Are there any Siri-based tricks you know about but no one else does? Let us know below... and remember there's more to come in iOS 8.